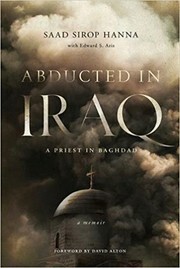 1 edition of Abducted in Iraq found in the catalog. Add another edition? Are you sure you want to remove Abducted in Iraq from your list? Published September 30, 2017 by University of Notre Dame Press . How do we respond in the face of evil, especially to those who inflict grave evil upon us? Abducted in Iraq is Bishop Saad Sirop Hanna’s firsthand account of his abduction in 2006 by a militant group associated with al-Qaeda. As a young parish priest and visiting lecturer on philosophy at Babel College near Baghdad, Fr. Hanna was kidnapped after celebrating Mass on August 15 and released on September 11. Hanna’s plight attracted international attention after Pope Benedict XVI requested prayers for the safe return of the young priest. The book charts Hanna’s twenty-eight days in captivity as he struggles through threats, torture, and the unknown to piece together what little information he has in a bid for survival. Throughout this time, he questions what a post-Saddam Hussein Iraq means for the future, as well as the events that lead the country on that path. Through extreme hardship, the young priest gains a greater knowledge both of his faith and of remaining true to himself. This riveting narrative reflects the experience of persecuted Christians all over the world today, especially the plight of Iraqi Christians who continue to live and hold their faith against tremendous odds, and it sheds light on the complex political and spiritual situation that Catholics face in predominantly non-Christian nations. More than just a personal story, Abducted in Iraq is also Hanna’s portrayal of what has happened to the ancient churches of one of the oldest Christian communities and how the West’s reaction and inaction have affected Iraqi Christians. More than just a story of one man, it is also the story of a suffering and persecuted people. As such, this book will be of great interest to those wanting to learn more about the violence in the Middle East and the threats facing Christians there, as well all those seeking to strengthen their own faith. Chapter 13 Are you not pleased? October 5, 2017 Edited by Todays Martyrs Reviewer Edited without comment. September 19, 2017 Edited by Todays Martyrs Reviewer Edited without comment. September 19, 2017 Created by Todays Martyrs Reviewer Added new book.